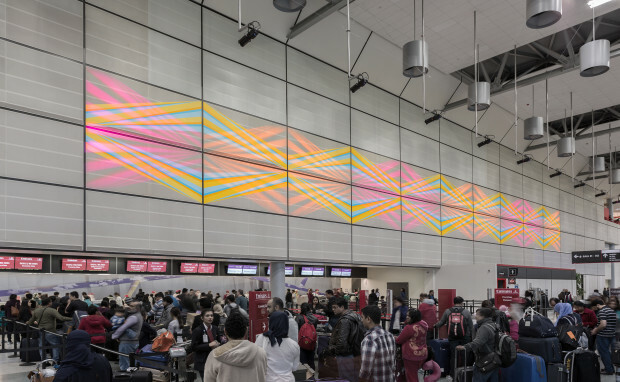 “Celestial Candyland” 15’ x 150’ and “Candyland Landing” 15’ x 45’ are two site-specific illuminated large-scale murals located 28’ above the International ticketing areas of Terminal D at the George Bush Intercontinental Airport, Houston, TX. 13 LED projectors superimpose a constant image upon a stationary geometric form. 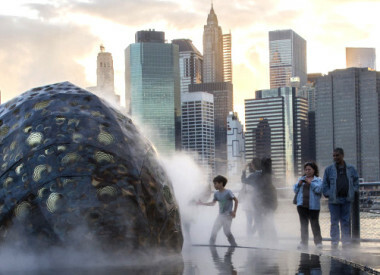 A choreographed changing color sequence provides a changing image to passengers below. The light image is altered by custom geometric images via glass gobos. A stationary form on digitally printed cloth as part of the terminal’s metal gridded wall. The image metamorphosis in line and atmospheric space as the changes occur.
. 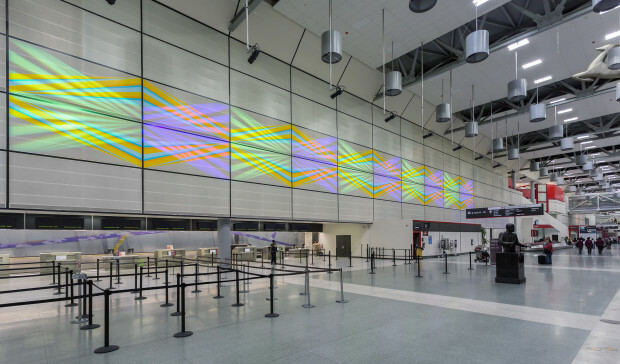 The two murals were designed to become part of the Terminal’s existing architecture. The art had to be fresh yet able to coexist within the givens of the space. Light, color and scale were key in conceptualizing the art for this 60’ x 400’ dark, gray and dated space. A given was the rectangular grid that could not be ignored. I made several trips to the terminal observing passengers and how the space was used. I knew by incorporating color through light that I could create a work that would activate this space. The wall itself was a blank canvas needing interest and to be activated. Architecture, geometry and scale are critical elements that have influenced my work for a long time. I strive to make living pieces with their own presence that incorporates the givens of a space. 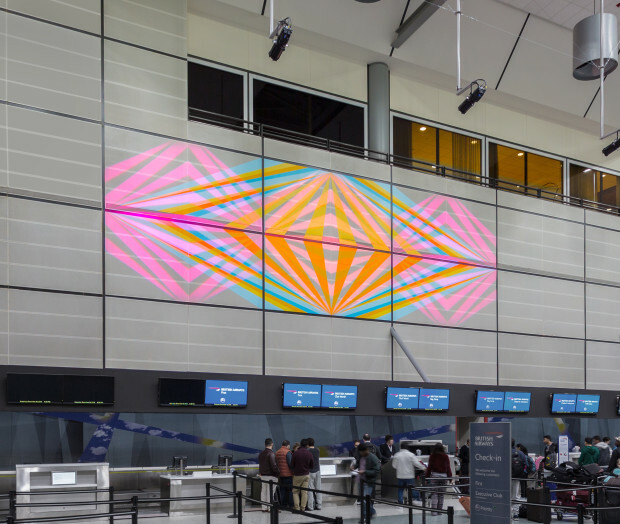 The living element of “Candyland” installation is enhanced by the 4-minute slowly evolving color sequence, which also provides an entertaining element to passengers waiting below. I chose this language of color and geometry due to its universal appeal and ability to relate to a diverse audience. “Candyland” provides a sense of repose during the hectic pace of international travel. The concept evolved by drawing in the terminal and in my studio. I always begin with hand drawings on graph and trace paper, in this case, for many days before moving the drawings to a computer. After concept was on sure ground, the collaborations began in order to visualize details thru animations, still digital experimentation and exploration. With the size and logistics of this project, approvals and permitting were necessary as I was working thru issues with the airport, City of Houston, and electrical and structural engineers. Many tests were done with the digital printed material and balancing the color and light intensity of the projections. Adjustments with the gobo images to correct key stoning were also details that needed to be resolved before final installation at the terminal. Eight weeks of after hour installations in which I, the artist, had to coordinate with contractors including electrical, metal fabricators, and other trades to bring this project to realization.